LOS ANGELES (ANS) — The Katinas have come a long way from playing in their father’s church in American Samoa, a beautiful unincorporated territory of the United States located in the South Pacific Ocean, to performing before 30,000 people at Dodger Stadium on Sept. 8, on the first night of Greg Laurie’s Harvest LA outreach. 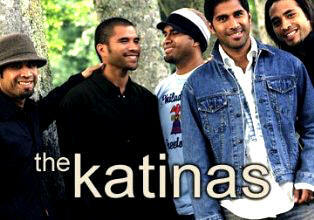 And what makes this Dove Award-winning Christian group so unique is that in today’s ever-changing music industry where bands arrive and then disappear into obscurity at a veritable breakneck pace, The Katinas have not only managed to roll with the changes, but they’ve done so with their original lineup intact for 21 years now. Undaunted by trends and the changing tides of the online music revolution, The Katinas, who recently released their 10th English language studio album, Collage, is composed of brothers John (vocals), Jesse (vocals), Sam (keyboards), James (bass) and Joe (drums) have continued to write and perform on their own terms-and love every minute of it. Their drummer Joe Katina told me that they have played at many of Greg Laurie’s Harvest Crusades, and the first one was at The Spectrum, an indoor stadium in Philadelphia way back in 1996. Was it the largest crowd you had played before at that time? “I’m not sure if it was because we also had the opportunity to play at a few Billy Graham crusades so but it was definitely one of the bigger ones,” said Joe. I then spoke with Sam, the keyboard player, and asked him to share about how the band got started. “We’re all brothers and we started the band in our home in Oceanside, California, where we were then living, but then in 1978, mom and dad went back and planted a church in American Samoa and we became our dad’s praise and worship band. “And here we are some 21 years later, still loving every opportunity that God opens up for us. John Katina, one of the band’s vocalists, then joined in the conversation and so I asked him what it was like to sing before such huge crowds. “Man it’s always a humbling experience,” he began, “but also we just we take it as an honor because I remember being in the small island of American Samoa and we would have these dreams as little boys that someday we would sing for people of all nationalities, and different age groups, and here we get to do that in a venue like Dodger Stadium. I then asked John what it was like for him when he saw so many people responding to invitation at the end of a crusade meeting to give their lives to Christ. “We rejoice with the angels and we know that not only is there a party going on in heaven, but we often think back to the story of our dad when he came back from the Vietnam war,” he said. “He was an alcoholic and miraculously God transformed him from alcoholism and a lifestyle of abuse. What happened to him and is he still alive? With that the three members of the band were off to opening up the proceedings for Greg Laurie and also play as thousands streamed forward onto the turf at Dodger Stadium on that first night. So for The Katinas, they were able to be a part in another great harvest of souls for God’s Kingdom, and they plan to continue to do this as they serve the Lord thousands of miles away from their homes in American Samoa.